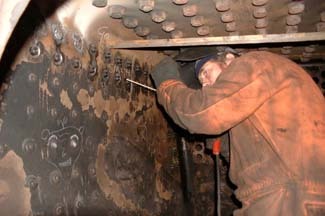 Work is progressing on the boiler at Grosmont MPD. The new stays are being installed and at the same time we are carrying out a full retube. The first set of tubes delivered were found not to be suitable and we are currently waiting for replacements to arrive. Whilst the boiler is stripped down we are taking the opportunity to have the boiler approved by Resco whilst they are at Grosmont inspecting 6619, 80135 and the K1. 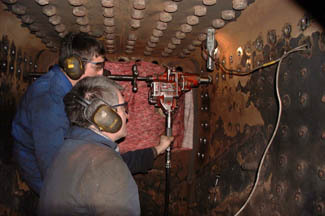 Grosmont fitters Dougy & Gary countersinking the inner firebox stay holes for the weld. 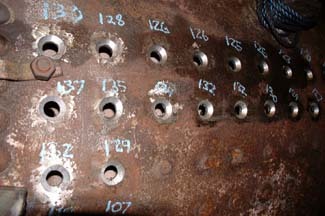 The outer wrapper is shown with the boilersmiths stay length reference measurements marked on. 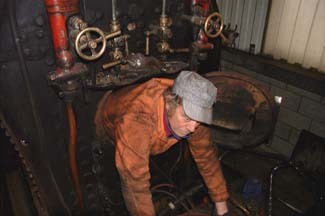 14th February work is progressing on the firebox. Coded Welder Mike Smith is seen easing into the fire box to start work on welding in the new stays. About to strike the arc. Welding in the fire box. 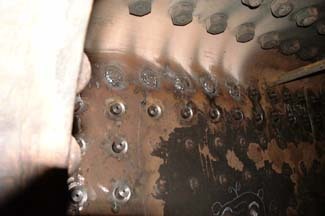 The inner fire box showing the newly welded stays. 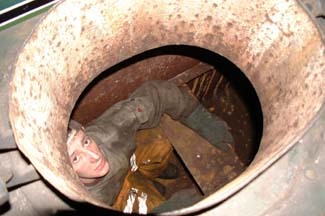 Boiler Smith Steve Kidd cleaning the inside of 29's water tanks.